Minor bug fixes and feature add-ins to our popular plugins Bulk Actions & Image Choices – Update now! We’ve made a few tweaks and bug fixes to our most popular plugins which we think you’ll love. 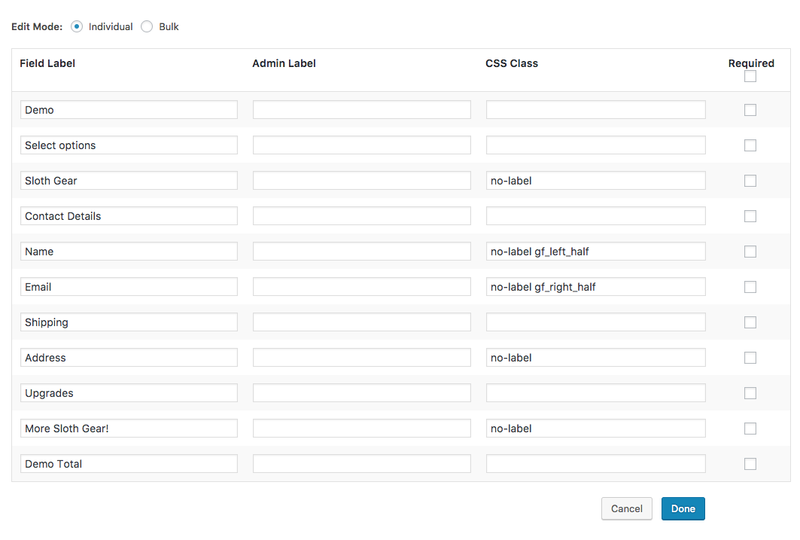 The biggest, of course, is the ability to now edit admin labels within Bulk Actions Pro. After much customer feedback and requests, we had a fair amount of users asking to allow Bulk Actions Pro to edit the admin field label in bulk. With the release of Bulk Actions v1.2.10 this feature has now been rolled out. You can now edit the Admin Label for fields in Bulk Actions – both the Free and Pro versions. Select the field(s) you want and click edit. You’ll now see the Admin Label next to the Field Label. This can be edited individually or in bulk just like you’ve been able to do for Field Labels. See the plugin changelog below. A couple of minor bug fixes for our beloved Image Choices for Gravity Forms add-on also.